These pancakes are perfect to serve for any Holiday breakfast or brunch. The Ricotta cheese makes them light and flavorful, and goes so well with the pears! Place diced pears in a microwavable container with lid. Microwave pears for 2 minutes or until tender. Remove lid and let cool. In separate bowl, combine dry ingredients and set aside. Combine wet side ingredients (not pears) in bowl of electric mixer. With mixing spoon, stir in ½ of the pears (save other half for pancake garnish) and dry ingredients, being careful not to over mix. Heat non-stick skillet to about 350 degrees on top of stove. Ladle batter onto hot skillet. Cook pancakes until bubbles form on top, then flip and continue cooking until golden brown. 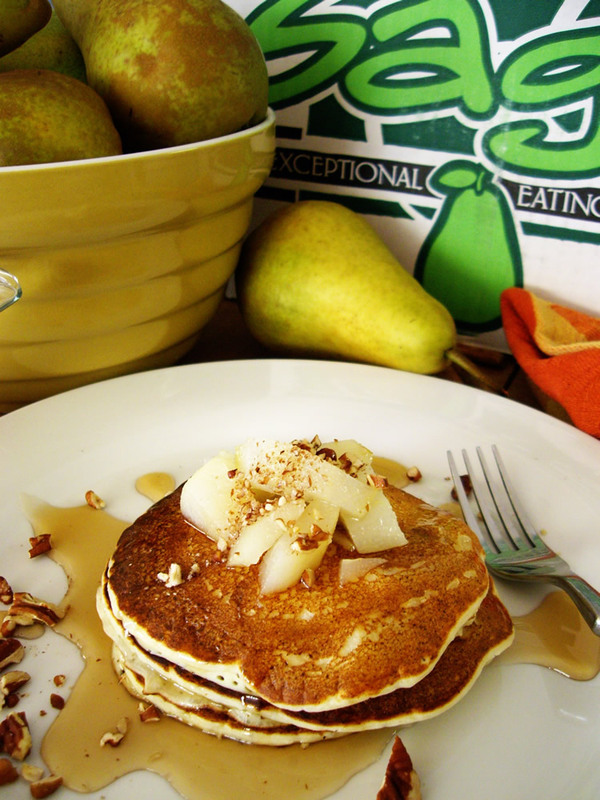 Plate warm pancakes and top each stack with a spoonful of remaining microwaved diced pears and chopped pecans (optional). Serve with warm Cinnamon Maple Syrup. Mix together: ¾ cup maple syrup and ½ teaspoon ground cinnamon. Warm in microwave for just a few seconds and serve with pancakes.